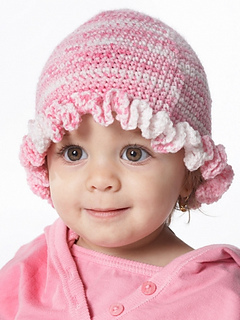 Description: Sweet crochet cap features a pretty ruffle around the brim. 1 ball of suggested yarn. Sizes: to fit child sizes 6 (12-18-24) mos. 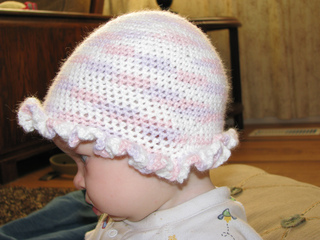 Available at FaveCrafts.com as “Baby Ruffle Hat”. Also available at Michaels website on the Wayback Machine.